If you were to rate your knowledge on traffic safety, particularly concerning bicycle and pedestrian (walking) safety, what score would you give yourself? Are you a wise walker? How about your family and friends or coworkers? The WalkWise program has arrived in the northeast Florida area as an expansion from the efforts of Florida Department of Transportation’s District Seven in the Tampa area, in conjunction with the Center for Urban Transportation Research in Tampa. 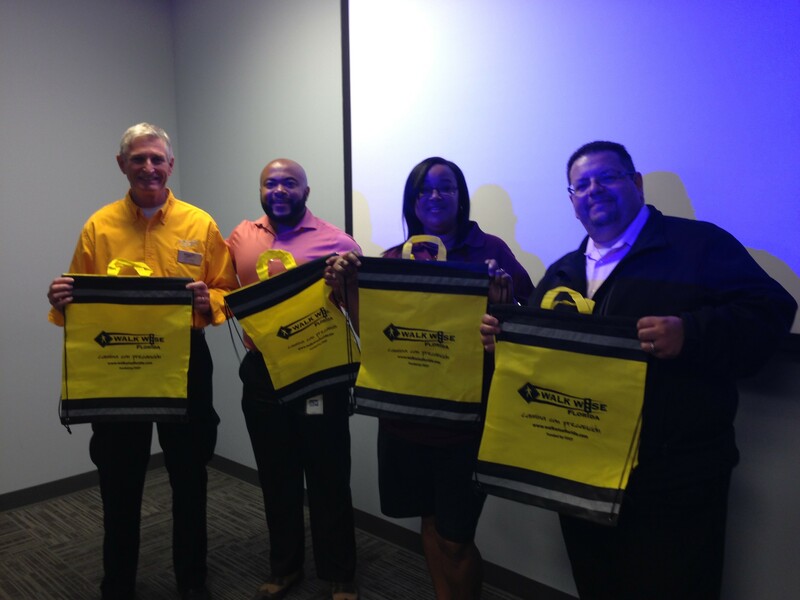 JTA Connexion drivers participate in the WalkWise presentation and receive reflective bags. WalkWise Florida is a grassroots program funded by Florida Department of Transportation (FDOT) that offers a free 20-minute interactive presentation focused on pedestrian and bicyclist safety. As you may have heard, the Florida pedestrian and bicyclist safety record has consistently ranked at the bottom of the nation. It is crucial that we spread the knowledge of pedestrian laws and safe behavior. We find that speaking to neighborhood and community groups is a very effective way of getting the word out and starting a community discussion about walking and biking safely. The presentation is fun and interactive, participants use clickers to vote for their favorite answers. Audience members are given a free reflective carry bag and receive WalkWise Ambassador recognition on the WalkWise Facebook page. 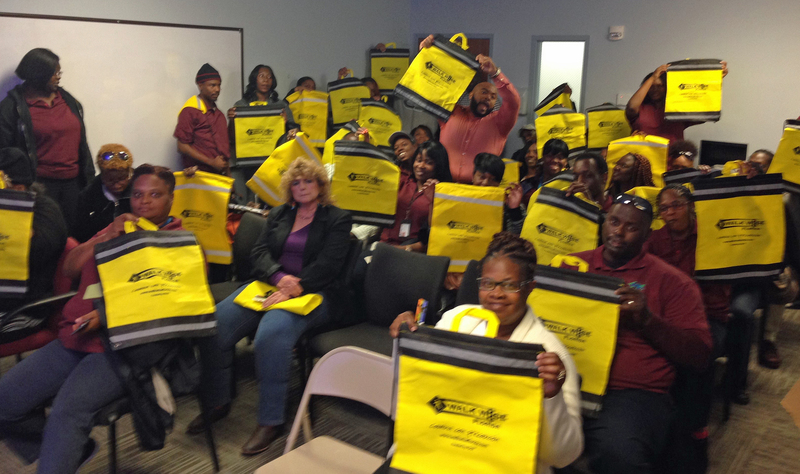 JTA Connexion drivers participate in the WalkWise program. Do you have a group – small or large – where this program can be presented to help keep them, their families, friends and co-workers safer around roadways? We appreciate the opportunity to present to civic and business organizations, homeowner and condominium associations, and any other interested groups around northeast Florida. The presentation can be adapted to be shorter or longer and customized to meet your needs. We are very flexible with scheduling, and will come to your location with the necessary equipment. The program also provides door-to-door business sweeps along busy corridors to inform staff members and gather information, as well as providing on-street education and tips. WalkWise Florida is a statewide pedestrian safety program that is designed to curtail Florida’s bicycle and pedestrian fatalities, which is why i’s crucial that we spread the knowledge of pedestrian laws and safe behavior. If you would like to set up a presentation or need further information for the northeast Florida area, please contact ron.tittle@dot.state.fl.us or (904)360-5457.